Review: A Pirate’s Life for Me! It’s no secret that I adore children’s pirate books. In a world of myth-busting party-poopers, it’s refreshing to sit down and read some gloriously illustrated tale that shares my shameless love of pirates, without letting history get in the way of a good tale. BUT, sometimes you gotta set the record straight with the young’ns and educate them properly as to the actual historical aspects of piracy, lest their heads become full of Hollywood mush. A Pirate’s Life for Me! does exactly that, covering the daily routines of your average Caribbean pirates from morning to sunset, with all the shipboard maintenance, eating, drinking, and fighting that typically occurs between. Actually, that’s not quite accurate – drinking is NOT covered. Nor are several other aspects of piracy that might upset the wee ones, as subjects such as torture, executions, and womanizing are perhaps a little much for their tender young minds. Cannons get shot, men fall overboard, but death at sea is mercifully glossed over. After the daily schedule is explored, the book goes on to briefly detail a few famous pirates from history and literature (carefully explaining which is which,) and then offers a short glossary of piratey terms. 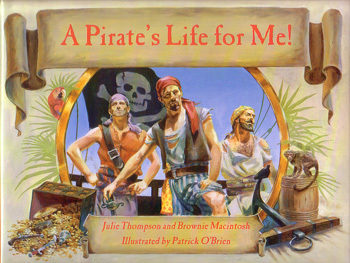 Illustrated by Patrick O’Brien (no, not THE Patrick O’Brian), the artwork skillfully depicts the gritty realities of piracy, rather than cartoonish fun more common in children’s books. The writing is simple and educational. Some of the history is questionable (walking the plank and burying treasure are treated factually), but by and large this book could serve as a fine, fun introduction to historical – as opposed to pop-cultural – piracy for your young barnacles. This entry was posted in Books and tagged children, non-fiction, thompson by Bilgemunky. Bookmark the permalink.